I’ve lived in a semi-arid environm ent all my life (except two years during college when I lived in England: a wonder of green, and skin that did not demand a daily slathering of lotion). Living where the air is perched perpetually at the edge of parched, my default setting is to welcome both the idea and the actuality of wet weather. Our precipitation, whether snow or rain, most often comes in dumps rather than in steady offerings. 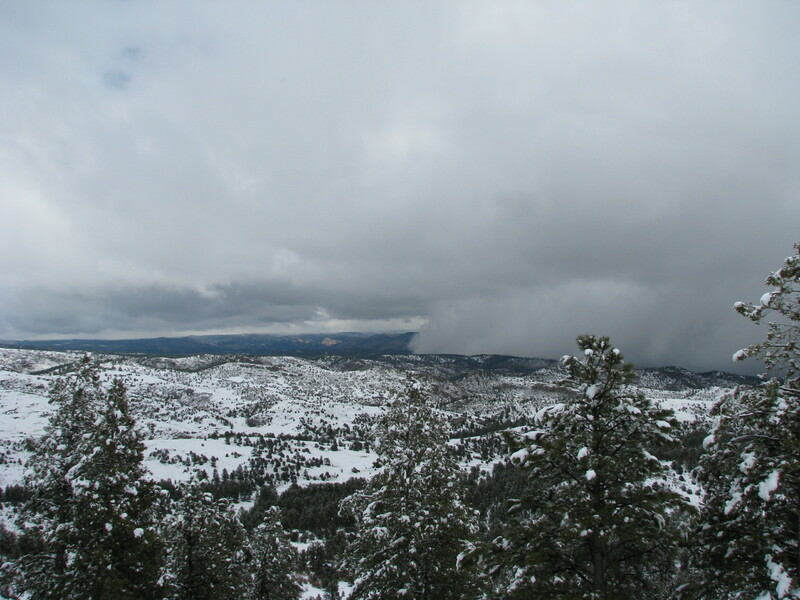 Sometimes it “rains” or “snows,” but more often moisture arrives with stormy accompaniments: blizzards with whipping winds, thunderstorms with zinging flashes and house-rattling thunder. One offshoot of this propensity for the weather to arrive in extreme bursts is that a single weather event can completely change my outlook for a month, or for a season. After a snowy late February, March, which is normally one of our wettest months, ran dry until the 18th, when a storm system brought fog, then rain, then heavy wet snow. I keep track of precipitation, and this single storm tipped the balance, transforming March from dry to average. After one little blizzard-y burst a week later, the weather turned dry and warm again. Then the wind started blowing. The gusting and blasting seemed to be seeking out any dregs of moisture that might be lurking in the landscape. When a fire broke out about ten miles northeast of our place (yes, folks, cigarettes tossed out of cars really do start fires), that snowy weather back in February seemed like a distant dream and I was starting to brace myself for a long summer of high fire danger. Another spring snowstorm finally formed up in mid-April. 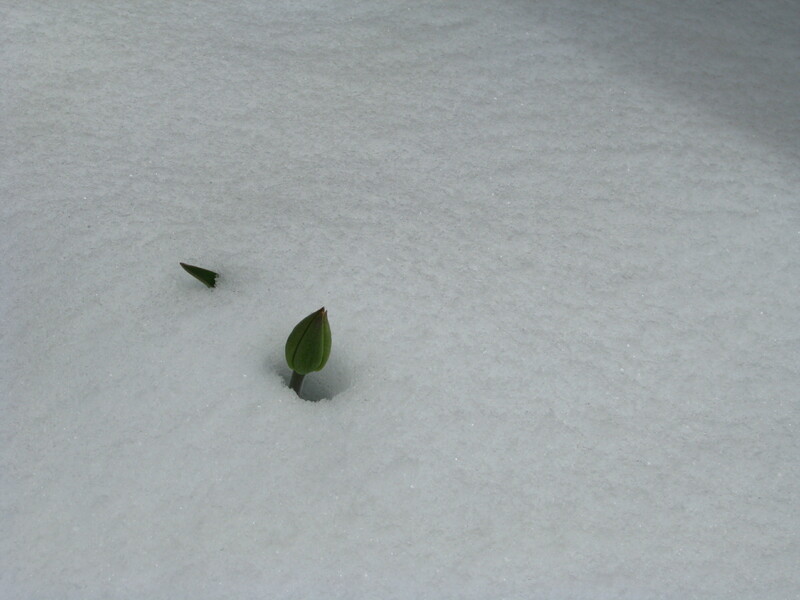 The snow melted as it fell initially, so the accumulation was hard to gauge. By the end, though, the ground had gulped almost an inch and a half of moisture. April, like March, abruptly had some respectable precipitation to show for itself, and desiccation was held at bay. The bulbs in the garden celebrated with an exuberant surge. When snow turned up in the forecast again ten days later, I cut some of those flowers so we could enjoy a little springtime indoors while winter raged outside. The sloppy dump of slushy snow added up to another 1.4” of precipitation. All of a sudden we had the wettest April since I began keeping precipitation records in 2006. Just one storm: I started thinking what a difference that one storm can make, both in my attitude and in the appearance of the landscape outside the windows. The snow melted, the grass made another surge. 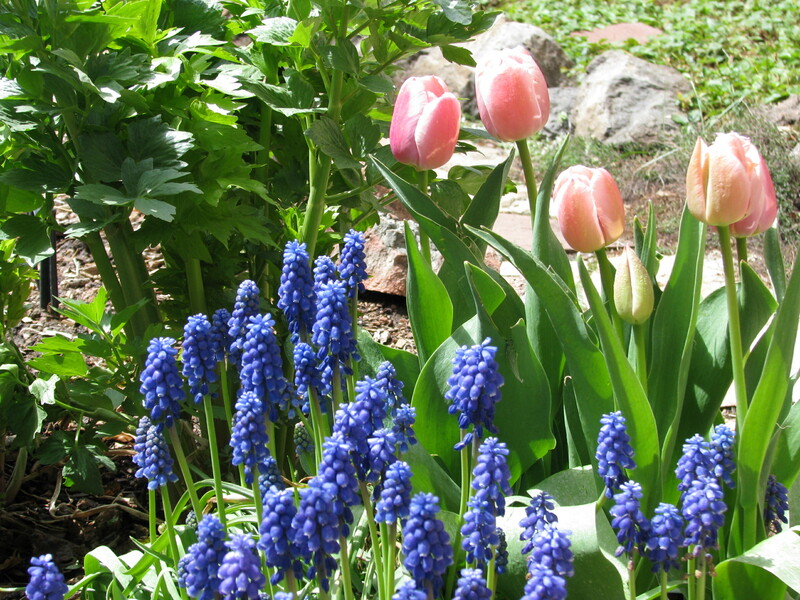 The tulips, muscari, and daffodils romped more enthusiastically. I could smell the sap rising in the pines. My satisfaction with my “just one storm” theory was short-lived. A monsoon-like pattern of thunderstorms set in on the first day of May, and since then we’ve only had two days without any rain. May 2015 is already the wettest May on my chart of precipitation recordings. I’ve gone back to my old theory about the weather up here: there is no “typical.” Every month, every year, plays out differently. The weather here resists regular patterns. I’ll decline to predict, and merely observe. 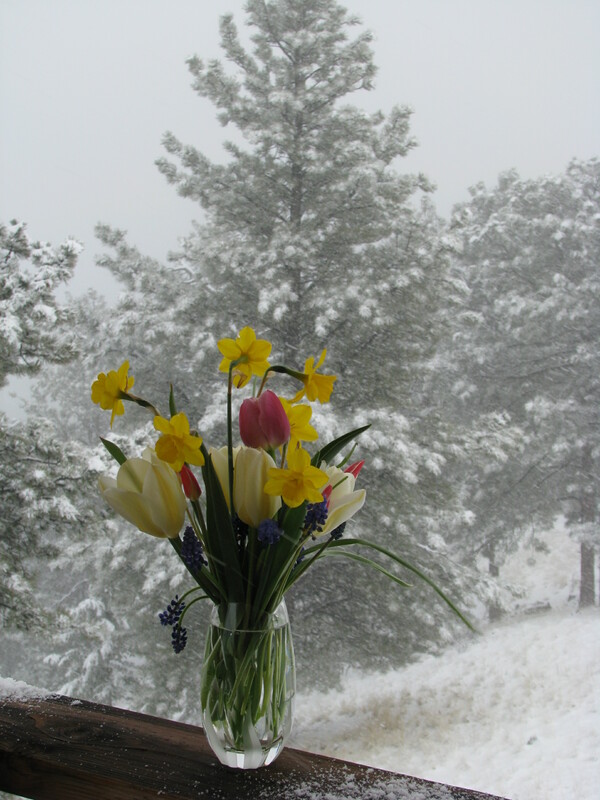 This entry was posted in gardening, observation, spring, weather and tagged April weather, high altitude gardening, spring snow, thunderstorms, tulips. Bookmark the permalink.